Welcome to The Secret Door, a collection of my favorite restaurants, hidey holes and places to hang out in Los Angeles and around the country. Feel free to peruse the page, or journey out and find any one of the locations... I'll probably see you there! An eclectic little street kitchen that is all kosher in the heart of a tiny strip mall on Ventura, this is a blink and you'll miss it kind of place. But the interior is warm and homey, run by some Israeli homeboys who really know home cooking. They basically have burgers (lamb, beef, salmon, chicken - no pork, obviously) and amazing salads and sides. I had the eggplant mess which was this insane babaganoushy mess (as advertised) with a harvest salad, which was warm and wonderful with a tahini vinagrette and some lovely grilled chicken. 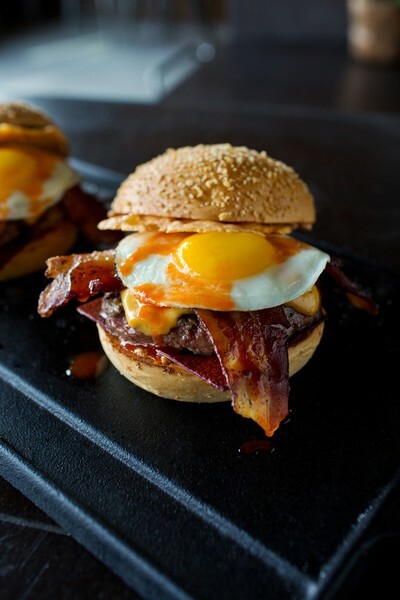 Add a fried egg to any burger and Go! Atwater is at that interesting juncture when artists, bohemians and hipsters start rolling over from being the early adapters to being the real identity of a place. The strip is making a turn from the thrift and liquor store drive by to a destination find defined by All'acqua and Proof Bakery, journeymen, and of course Dune. Nestled in the middle of the street under an unassuming grey awning, the gold writing on the windows welcomes you in a 19th century barbershop style. As you enter, the smells of zatar and seared chicken fills the small interior and you can spot what you want on the laminated card menus or the foodstuffs jotted up on the mirror. It's mainly mediterranean fare, sandwiches or plates deeply piled with seared or fried chicken, lamb or beef. Their falafel is lovely, and what Dune is known for, crunchy and bright with strong flavors of lemon, garlic, chickpea and fresh parsley. Scott Zwiezen who also created the vegetarian restaurant Elf knows his way around a vegetable and so he gives you distinct flavor layers that made an Egyptian friend of mine very happy. The falafel is especially nice on the Meze plate, which is a melange of just about everything they make at Dune. The pita comes freshly made, hot from the oven, next to the chicken which was beautifully cooked. The pickles are crunchy and acidy, while the black olives are strongly bitter in just the right way. Add a bit of the refreshing cabbage salad to cleanse your palate in between bites, and perhaps head back in for a slice of bakalava for dessert. There are two burgers in the world. The one that you think you see and the one that you actually see. The one that you think you see is the one that appears daily to you out of the corner of your eye, in McDonalds commercials, or Arby's or Burger King or Chili's or any number of the innumerable fast food joints that spend a million dollars a minute to keep your eye on just this burger, just this onion ring, just this piece of bacon. The thing is, they are trying to get you hungry enough to come into the joint (I won't deign to call it a restaurant) and eat something that tastes vaguely what you think that image might taste like. It's a cognitive disconnect and makes people have a great eye for what a great burger looks like, but no actual feel for what a great burger tastes like. Not so with Plan Check, which has both the aesthetics down pat, as well as a superior burger. I was hungry when I stumbled into Plan Check, not ready for the tastes that I was going to have, so when I was hit with the combo of their chef's special burger, I was quite blown away. First of all, let's talk about two different kinds of cheese. One melty and traditional, bending over the pure beef patty, and the other a crispy cheese, that added not only a deeply sharp cheddar taste, but a mouth feel that was off the chain. Now let's talk ketchup leather. That's trademarked by Plan Check. It's a process that makes the ketchup into something more akin to a fruit roll up. I dug it, but it's not for everyone. I like it because it gives you a really fantastic ketchup taste, without jacking up the bun. And can we talk about the bun for a second? Because of the no-carb, lo-carb, gluten free, I just don't like bread movement in LA, I feel like the bread that you do get is thrown on like an afterthought. It's treated as a handle to hold the food that people have actually concentrated on, not something that can complete or take away from the meal. At Plan Check they've thought about this. The burger is, of course, superior. But the bun is sublime. Just the right amount of crisp and soft and dammit-I'm-having-bread-today-even-though-it's-outside-of-diet goodness. And did I mention that they have two different types of bacon on this burger? Not two slices. Two different types. But no one needs to upsell bacon. It's topped off with a fried egg. Because, why not. Go get one. Aren't you hungry yet? Medium: Wow. That's really really hot. I need to get another Thai ice tea. Hot: Jesus, I can't feel my lips. I highly recommend getting 'morning glory.' It's a Thai dish that's a simple green vegetable in garlic sauce. It has a similar light bitterness to spinach mixed with a lovely sweet overtone and a satisfying crunch. The catfish salad is spectacular and they are renowned for their crab fried rice. They have an alternate pad thai called "Khon Kaen", named after the city, usually listed as "KK" on the handy white board on the wall. This is a beautifully constructed pad thai with tofu strips, fat shrimp and a light dusting of chili powder for heat. All the panangs and curries are wonderful, I have never gone wrong with anything that I've tried there. Say a mantra and go! Arroy is the only foodtruck that I have driven away from the location, tried a bite in the comforts of my car and immediately driven back to let the chef know just how good the food I just tasted was. They are to Thai food what the Kogi truck is to Korean. An offshoot of Buddha Belly restaurant, the truck can be found at 3rd and Grand downtown. The best of what they have are these Thai spicy sliders that are really exquisite and worth the inevitable line. Also, you can do the healthy option like I do with just a vegetable curry, and you will never go wrong. So take a trip to downtown and see what these guys have to offer. It’s not pretty. Look at the sushi. Japanese prize pretty presentation. Balance, Seasonality, Empty Space, Arrangement. You think wasabe slush fits into this mix? No. It makes the wasabe taste terrible. This is true even if they are essentially using green colored Chinese mustard instead of Wasabe. It ruins the taste of the soy sauce. So with those tenets in mind, go and get the Omakase and listen when he says, “No soy sauce please!” That is the Japanese ultra-polite way of saying “Eat! Or no sushi for you! One year!” The butterfish melts in your mouth like, well, butter. And the blue crab hand roll is something to be experienced. Go.